This morning as I took a meditative walk on a beautiful, mild, summer day with my old dog, Maggie, I thought about the cycles of the seasons, of life, death and rebirth. I felt the awesome power of life being experienced in a single moment, deep in my bones, which is not surprising given that we're in the month ruled by Cancer, archetype of the Great Mother. This is a time when we are often more aware of emotions washing over us like ocean waves, flowing in, baptizing us, and then just as surely flowing back out to sea. There is no need to do anything other than notice and accept the inevitable tides. I have come to see I am in the autumn of my life and I am beginning to accept that I must slow down and take pause, experience more of the present moment and less frantic hurrying to the next. It hasn't been an easy surrender, and I am not sure I am even there yet, as I still have things to do. But there is a subtle shift taking place within me, a shift of perception, a need to turn the prism lens and see things differently, to allow new ways of being to take hold. 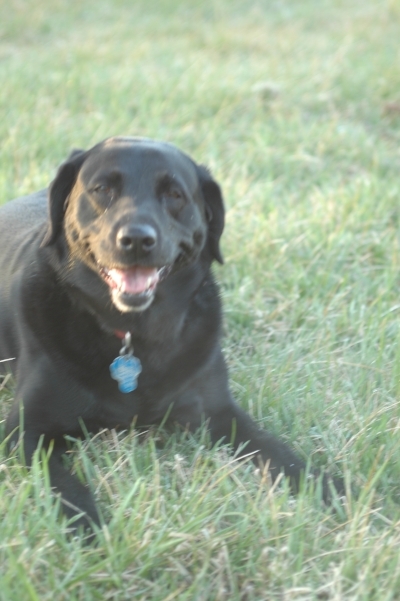 The ritual of taking a morning walk begins with Maggie, our black lab, dancing around me eagerly when she sees me putting on my shoes. I don't dare say out loud that we're going for a walk or she will bark incessantly, unable to suppress her excitement. I am aware of the time I spend with her now as I know that at 11 years old, she doesn't have many years left with us. Yet she still has plenty of puppy energy even though her chin has turned white with age. (I am starting to see the similarities between us.) She has become more protective of me lately and follows me around the house, always close at hand, usually napping contentedly, while I cook or read or work at the computer. When I leave, she curls up on the rug by the door to await my return. Thoughts of Maggie's presence in my life and the gratitude I feel for her companionship shift as I walk with her down our shady street to thoughts of my mother and father. Yesterday, my husband, Rob, and I rode our bikes the half-hour trek on country roads to the Honeysuckle Tea House for a Sunday sup. When we walked into the peaceful, open-air teahouse, the medley Somewhere Over the Rainbow/What a Wonderful World by Israel Kamakawiwo'Ole was playing. This song is one I have designated as my dad's song as he loved the song, What a Wonderful World. Rob and I exchanged a smile and my eyes welled up with tears. It is a song that is reflective of my dad's optimistic and appreciative view of life. I feel fortunate that I had a father who would say to me, "Life is beautiful. Every time you hear a bird sing, remember that." He told me that my grandfather opened his eyes as he lay dying and spoke his last words, assuring him "It's beautiful." My thoughts of my mom have been more and more about the gifts she gave me even though I spent much of my adult life focused on what I didn't get from her and longed for. My life's journey, and indeed, my soul's purpose, I believe, has been to heal the mother wound that was passed down, through her and through my grandmother that originated who knows how many generations back. I feel that wound is healed now and I feel deep forgiveness for her unintentional emotional abandonment as she did not know what to do with her own feelings of loss, nor did her mother, and so it went back through time. The gifts my mother gave me were of a fertile and active imagination and the need to seek a deeper spiritual understanding of the world. As I walked this morning, I remembered how she comforted me at night when I had restless thoughts of spirits in my bedroom and feverish dreams of other worlds. She rubbed my back and taught me a prayer that began, "Father Mother God loving me..." These were the seeds of the divine feminine taking root in my psyche that would later provide the soothing balm to the ancient mother wound. I believe the reparative work she helped facilitate healed back generations of women in my family and forward to my daughter and for generations to come. Tomorrow is her feast day, a national religious holiday in Mexico. It commemorates the day in 1531, when a lowly peasant named Juan Diego, climbed the hill at Tepeyac, north of Mexico City, where the sacred pyramid to the Aztec lunar mother goddess, Tonantzin or Tonan, once stood. There, Juan Diego met a young, dark-skinned woman who speaking to him in his own native language, Nahuatl, requested that a chapel be built upon that site. Diego took her message to the local Catholic bishop, who refused to believe his story without proof. Diego went back to the site where the woman told him to gather roses to bring back in her honor, which he thought would be impossible to find in the desert in December. But when he turned around, much to his surprise, he found a bush of roses in full bloom and gathered as many as he could in his cloak and returned to the bishop. As he opened his cloak, the roses fell out in a profusion of color, and an image of the lady appeared on the fabric of his cloak, convincing the church father that she was an apparition of the Virgin Mary. There were some in the indigenous tribes and villages of Mexico who believed she was, in fact, the goddess Tonan, who had returned to help her people after being conquered by the Spanish, whose mission was to convert them all to Catholicism. But many came to see her as the blessed Mary of the Americas, who, no matter what name you give her, watches over her people. But as we know, Mary has her roots in the ancient mother goddesses that exist in all cultures. I like to think that she is powerful enough to live on through the patriarchal structure that has prevailed even today. You can see her as a Catholic religious figure and the mother of Jesus, or you can see her as an ancient mother goddess who represents fertility, and the bounty of the earth. It doesn't matter for her meaning is deeply embedded in her image, and in our collective unconscious, in our very DNA. She is also known as "Mother of Maguey," as she stands in the middle of a maguey, or agave plant, which appears to be rays of light or spiny leaves. The plant has medicinal and healing properties and its juice is known as "virgin milk." Her blue-green mantle of stars is symbolic of the divine Aztec couple, Ometecuhtli and Omecihuatl and her place amongst the stars. Her belt is said to indicate her pregnancy with the divine child. She stands upon a crescent moon, reminding us of her origins as an ancient lunar goddess. Even her appellation of Our Lady of Guadalupe harkens back to her indigenous origins. It is said that the name Guadalupe came from one of two similar sounding words in the Nahuatl language, which did not contain the letters "g" and "d," so could not have been Guadalupe originally. One similar-sounding Nahuatl word meant, "She whose origins were in the rocky summit," alluding to the ancient goddess, Tonan, and the other from a similar-sounding word that meant, "She who banishes those who devour us," again referring to the return of Tonan as protector of her newly-conquered people. To the Spanish conquerors, she was a useful icon to gain converts from the native people who once revered Tonan and had a system of understanding the world through the Aztec iconography and mythos. While the Christian churches were built on the very ruins of the Aztec temples, the pagan beliefs and practices were not so easily demolished, and the goddess triumphed. So when we look at the beautiful black Madonna of Our Lady of Guadalupe, we can see her through time as an enduring image of the divine feminine. It is ironic that even as she stands as a national symbol of Mexico, where pilgrimages to Tepeyac hill occur every year, women are banned from approaching the sacred relic on display behind the altar at the cathedral of Guadalupe. The patriarchy endures for now, but the goddess lives on. Light a candle for Her on December 12 as we bring in the return of the light that the Winter Solstice promises on December 22. In honor of Our Lady, I am again including information about how to order your own goddess rosary from Jennifer Mantle, who is happy to put together a custom order for you with the goddess and beads of your choice.